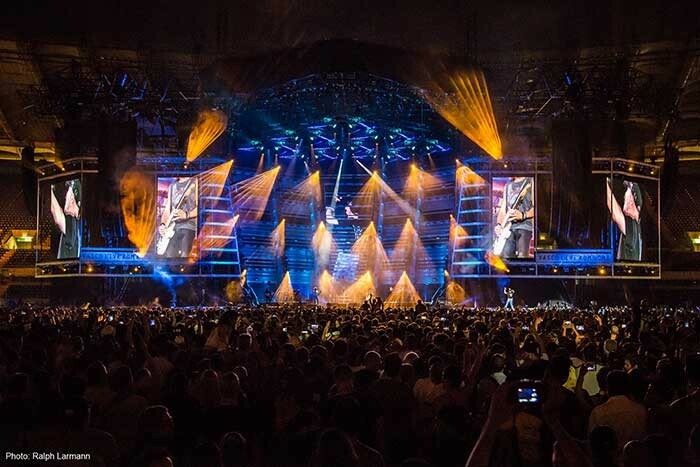 Italy – Vasco Rossi is back, and he is in great shape. He kicked off his new summer tour with a zero date at the Lignano Sabbiadoro stadium on 18th June. The "unauthorised exclusive preview" announcement arrived in a post on Vasco's Facebook page. 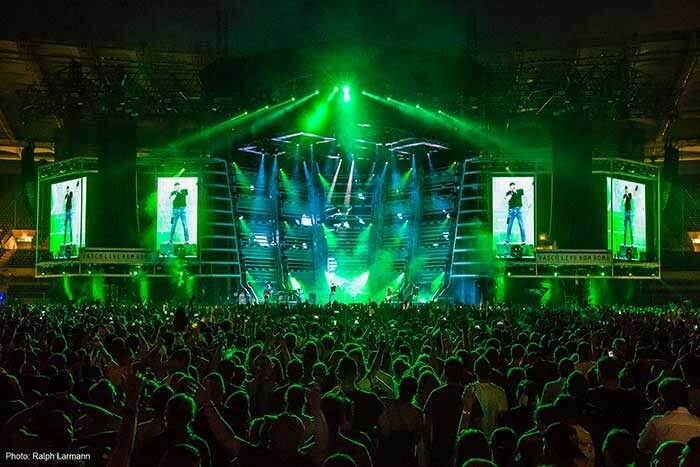 After the long 2015 tour that stopped off in Bari, Milan, Bologna, Padua, Messina, Florence, Turin and Naples, Live Kom 2016 arrived in Rome with a new, powerful, exciting show, a new line-up, and new stars on the stage: Clay Paky Spheriscans. 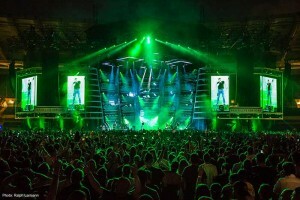 Vasco demands and invests a lot of creative energy in his live events. When he walked onto the stage of the Olympic Stadium in Rome, 200,000 spectators burst with joy, enthralled by the excitement of his music. 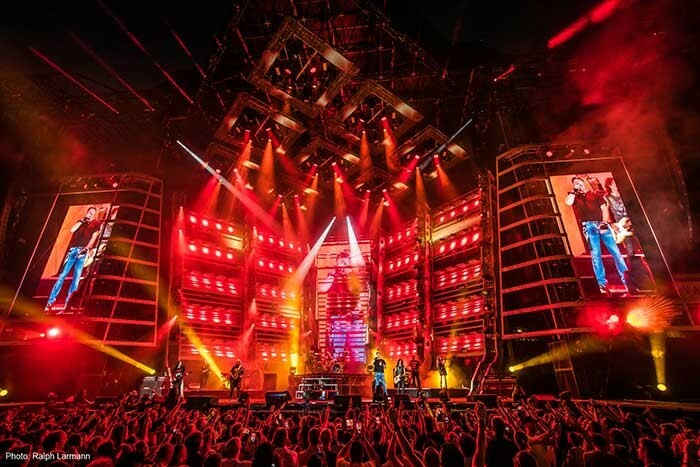 Among the lights that make up the lighting design, there are many Clay Paky moving heads: 54 Sharpys, 50 Sharpy Wash 330s and 24 Alpha Beam 1500s. The Sharpy has set a new standard for light output, weight, ease of use and reliability. They are arranged along the whole 81 yard (74 metre) front of the stage roofing to form a frame and their beams are used a lot. “I only recently discovered the Sharpy Wash and I used a lot of them because they won me over completely.” They are powerful, compact and agile. They have striking colour qualities when used just like traditional wash lights to illuminate the band and the stage, precisely for their special colour quality. The super concentrated light beams of the Alpha Beam 1500s were used for their fantastic mid-air effects and their optical tools, which you can use to change the shape and size of the beams and enrich them with colours and dynamic movements. 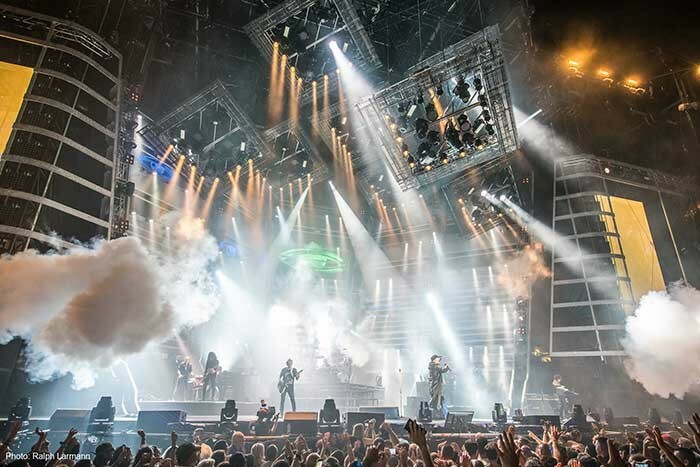 As for Clay Paky's latest innovations, Giovanni Pinna asked for 16 Spheriscans. These are scanners with a mirror that rotates at dizzying speeds without stopping. The mirror speed, which may be adjusted as desired, reaches a maximum of 250 rpm, that is more than four revolutions per second. “We had little time to integrate the newcomers into the show due to bad weather: we were literally pounded with rain. I tried to make the most of the Spheriscans during the most poignant moments of the show, and where, in my opinion, they were best suited owing to the characteristics of the pieces such as Gli Spari Sopra, Ormai è tardi, and Alba Chiara. I used their endless rotation several times, but at different speeds and in different ways each time. The Spheriscan is perfect for outdoor installations thanks to its special housing and the transparent cover that protects its mirror (IP54 protection rating). Using a special support system (optional) you can fit the lights flush with the stage flooring making it possible to aim spectacular scenic projections at the stage and at the audience. It is a new powerful effect light capable of adding an original distinctive touch to the show.